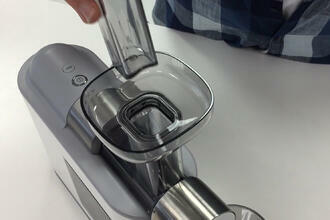 A horizontal juicer like we'd never seen before. We also tried two recipes: Tomato Basil Soup and Red Sensation. The soup, which involved juicing tomatoes, basil, and red pepper together, then heating it with coconut milk, was quite tasty. We did need to add some vegetable bouillon to bring out the flavor, and some cornstarch as it was quite watery. This juicer had no problem with these ingredients. The Red Sensation was a tasty mix of watermelon, strawberries, pineapple, and lime made quickly and easily. 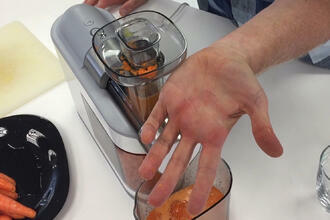 Overall, this juicer is a mixed bag. Made in China, it feels solid and looks great. It operates fast, and is very easy to clean. However, the compact design creates performance limitations and the lack of juicing screen creates watery, pulpy juice. 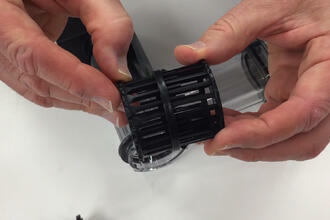 The plastic filter is fragile, and one of the pins on it bent after a few uses. If you plan to juice things like oranges, pineapples, and soft fruits, it is an attractive option. 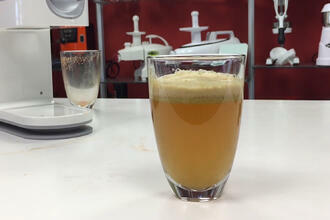 If you want to juice leafy greens and root vegetables, we recommend a true slow-speed horizontal juicer. Also, the two-year warranty is pretty skimpy compared to the 10+ years offered on competing models.